HÀ NỘI — The achievements Việt Nam recorded in 2018 have given the country valuable lessons, creating a firm foundation for it to develop, reform, and integrate into the world, Party General Secretary and President Nguyễn Phú Trọng said. In an interview with the Vietnam News Agency to mark the Tết (Lunar New Year) festival, the leader said despite a range of difficulties and challenges, the country had maintained rapid and comprehensive development. Việt Nam had completed all 12 set targets, with its gross domestic product (GDP) growing more than 7 per cent to exceed US$245 billion and about $2,580 per capita, he said. The stable macro-economy, controlled inflation, and consumer price index (CPI) at below 4 per cent were major achievements, he said, adding the country’s exports continued to rise and trade surplus hit a record of more than 7 billion USD. Last year, the tourism sector earned VNĐ620 trillion ($26.66 billion) from nearly 15.6 million international visitors and 80 million domestic arrivals, gradually becoming the country’s economic spearhead. The important socio-economic achievements also contributed significantly to raising people’s material and spiritual life, ensuring political stability alongside social order and safety, the leader said. External affairs and international integration had been stepped up, contributing to protecting national independence, sovereignty, territorial integrity, and strategic interests; consolidating a peaceful and stable environment for development and elevating Việt Nam’s prestige and position on the world arena, General Secretary Trọng said. He said joining the Comprehensive and Progressive Agreement for Trans-Pacific Partnership (CPTPP) was a step forward to materialise policies of the Party and the State in international integration, and confirm Việt Nam’s role and geo-political position in Southeast Asia, Asia-Pacific, and the world at large. 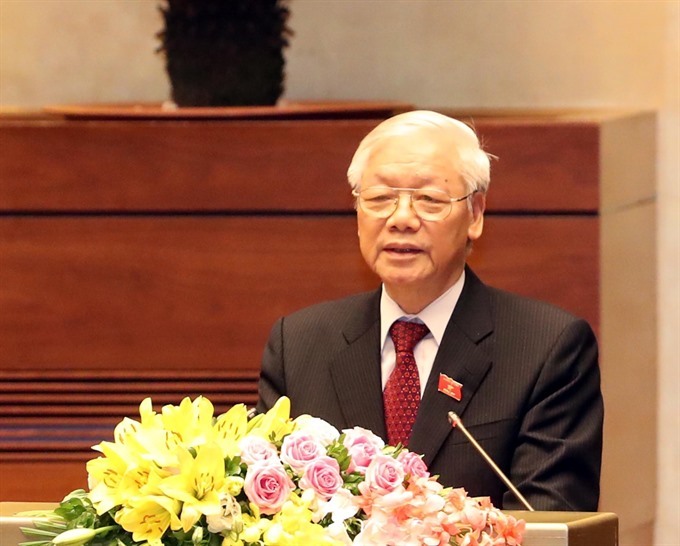 The CPTPP membership was also significant for Việt Nam to take advantage of external resources and mobilising internal strength, effectively serving national construction, defence, and development. Regarding the fight against corruption and undesired phenomena among Party officials, he said competent agencies had taken an active part in the combat and sped up the verification, investigation, and settlement of serious and complex corruption and economic cases, especially those in oil and gas, banking, and public asset and land management. According to the leader, the strict punishment of many officials at all levels, demonstrates no one is above the law. This is a long-term struggle that requires resolve, patience, and scientific methods for the purity and prestige of the Party, sustainable development of the country, and the wish and happiness of the people. “There are many more jobs to do and do better, but the first hurdle lies with how to create more remarkable changes in administrative reform and pragmatically remove bottlenecks and barriers to the investment, production, and business activities, thus facilitating the mobilisation of all resources for development,” he said. “A constant key task is to build a pure, strong, and effective Party and political system,” he told the VNA.